I finished the first block some time ago, and now I have two blocks. Only 10 more to go! I’m using Judy Laquidara’s pattern, Bears in the Farmhouse, which I thought was just perfect for this focus fabric, which contains many colours. 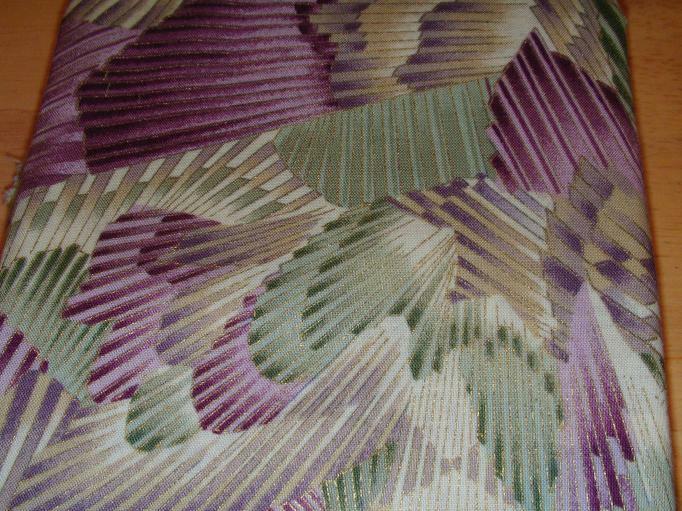 My focus fabric is “Kaleidoscope,” which was the Hoffman Challenge fabric for 1997. I sewed a quilt top from this pattern last year as a participant in Judy’s Quilt Along but used radically different fabrics. My version is called “Bears in the Art Museum”, as my focus fabric was based on the artwork of Paul Klee. So, even though these two quilts will be from the same pattern, they won’t look anything alike. 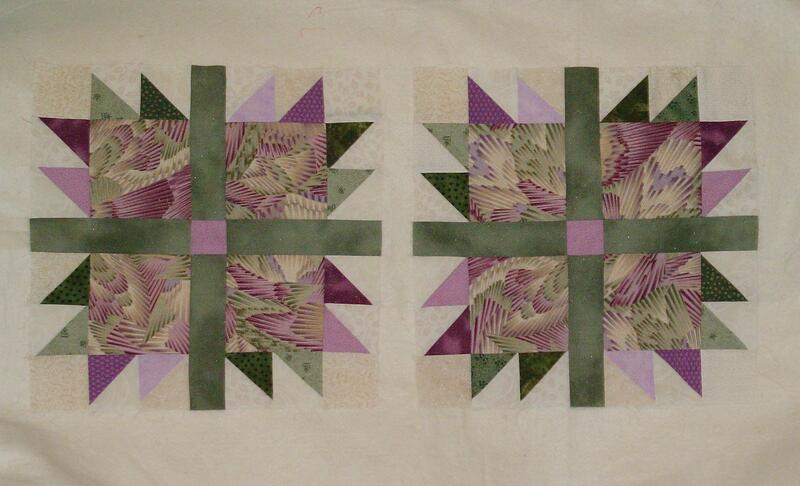 How funny, I saw that block at my patchwork class tonight – it is looking lovely – keep posting pics! 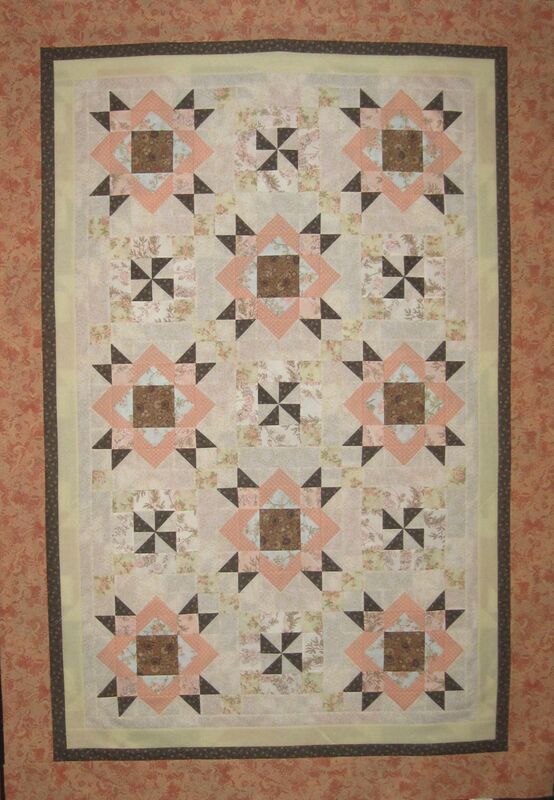 I love the way you can use different fabrics and get totally different looking quilts. I can’t wait to see the Kaleidoscope fabric quilt as it progresses. Both quilts are wonderful. I LOVE how fabric completely changes the pattern look. great work! I love your focus print. Hoffmans are always beautiful. Yeah for you—some much needed attention to the Too Good to Cut! My top still awaits (actually, have it up for sale–!!! ), but if it’s still not sold come October, I’ll finish ‘er up really good! (if not before). I am very pleased with the outcome! The fabrics ended up working out beautifully! THANKS for the challenge to get them cut and used!!!!! on June 28, 2010 at 4:11 pm | Reply Deb in MN. Wow, I have that fabric and it is STILL on my shelf! Glad to see it used, so I can start thinking of something to do with it! Good idea. uh oh–I better get moving! I can’t wait to see your completed challenge quilt. Mine is at the longarm quilter’s and should be finished by the end of July. I can’t believe I’ve finished the top already. Must have been the challenge! 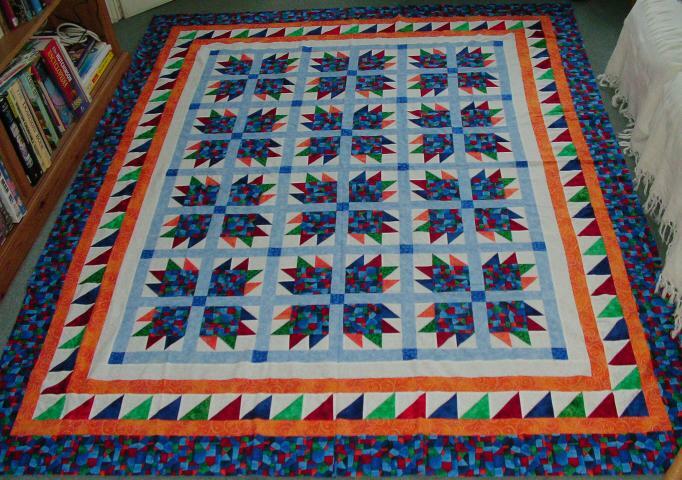 Opps, I agree that I need to get moving on my challenge quilt – have the front done but waiting for inspiration for the quilting…. Loved Judy’s Bears and these are both great examples of how colors change everything! Wonderful. It’s ages since I went round the HeartStrings blogring and I’m finally catching up! I love the way your blocks are turning out. I took my challenge blocks off the design wall and stored them way for a bit. There’s something not quite right with the way they look and I can’t seem to figure out what it is. I thought if I wasn’t looking at them everyday I might have a fresh eye when I take them out again. Unfortunately, I left the project box I stored them in at home when we packed up to head to our summer house. Hopefully, my husband will bring them out when he goes home to get the mail next week. I’m determined to get this quilt finished no matter what.